This one is true all the time. In January, I posted this photo of my two very tall college-age sons on social media. It struck a positive chord with a lot of people. So now, as we approach the warming days of spring and the conclusion of another great ski season, I’m sharing it here along with what I wrote to go with it. The Family Skiing Challenges Are Worth It. I Promise. When each of these men were three-year-old boys, we taught them to ski. 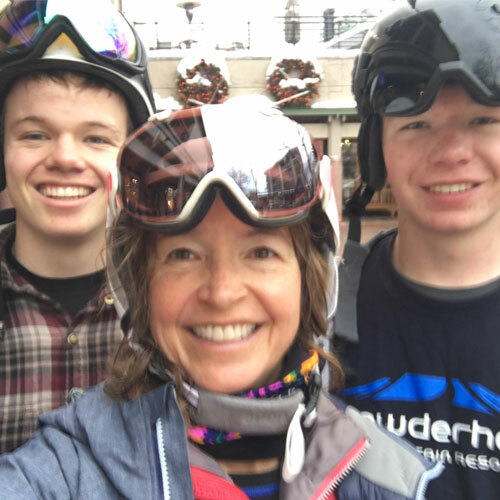 From bunny slope to skiing the mountain, from alpine racing to jumping off cliffs and skiing through chutes, from exploring our local resort to traveling the world with ski boots, we have easily spent more time skiing as a family than any other activity. The sport has bonded us together. The time spent on your knees buckling stiff little boots, the time spent picking someone up after a fall and brushing away tears, the time spent arguing about what time to leave the house on a cold morning, the time spent driving to races and returning home well after dark, the time spent brokering agreement over which run to ski next and the time spent on the bunny hill or in the lodge when the snow conditions are perfect (and you’re missing them) does pay off. If you have family skiing thoughts, experiences and stories, or suggestions as to how you would end the sentence…”the family that skis together…” please share them in the comments.